Long story short, doing bug bounties for mobile devices is hard. With this article I want to show you a rather simple way to be able to bypass certificate pinning for all some of your Android mobile targets. The method described here is based on research and an awesome blogpost+script written by Piergiovanni Cipolloni. Whenever there was a bypass for certificate pinning it was always involving manipulating the SSLContext of the application. The researcher showed a way to invoke Frida and manipulate the SSLContext to build a script that is able to universally bypass certificate pinning on Android. In a final step it creates a TrustManager that trusts the CA in our KeyStore. Whenever the application initializes its SSLContex, the Frida script hijacks the SSLContext.init() method and when it gets called, the 2nd parameter, which is the application TrustManager, with our own TrustManager we previously prepared. On Android the SSLContext function is called as follows: SSLContext.init(KeyManager, TrustManager, SecuRandom)). From a beginner’s perspective it is hard to get to the same point as Piergiovanni Cipolloni, therefore this blogpost will include a bit of an introduction to get everything setup properly. How to invoke the script with your application. With certificate pinning a developer ensures that their application does not accept fake certificates that are actually signed by an official certificate authority. The Android system itself only checks if the hierarchy of the certificate is correct and whether the CA (Certificate Authority) is listed in the so called „certificates of trust store“. But what happens if a malicious person installs a fake CA into the trust store? Well basically that person would be able to intercept the entire HTTPS traffic for the application. For this reason developers go a step further and compile the real certificate in the app and ensure that only this certificate can be used. ADB / Android Tools installed + configured. With Burpsuite running go to your browser (default: 127.0.0.1:8080) and click on CA Certifcate. This will download a file called cacert.der, take the file and rename it to cacert.cer. If you are wondering what the difference here is, please visit this link: http://www.gtopia.org/blog/2010/02/der-vs-crt-vs-cer-vs-pem-certificates/. The short story is it is just an alternate form. 3.) adb push cacert.cer /mnt/sdcard/DCIM/ – This copies the certificate to the SD card of your device. On the device itself (whether virtual or real) we have to install the certificate in order to put it into the Android trusted cert store. Tap on the cacert.cer and name the certificate for example Burp. 🎉Hurray! 🎉 – You have now installed your own Certificate Authority to your system! Now that we have installed the PortSwigger (💗) CA on our system we need to setup the proxy in order to intercept the traffic from the application the server. Once again go to Settings -> Click on Wi-Fi -> Hold and Click WiredSSID -> Click on Modify Network -> Click on Proxy -> Choose Manual. Proxy Hostname – Is the IP Address of your Burp Suite Application (of your PC, your local IP Address). Port – Is the Port you have Burp Suite running on (default is 8080). 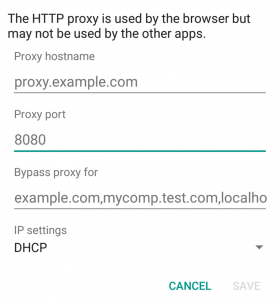 Burp, by default opens a local Proxy running on localhost Port 8080, in order to intercept our mobile traffic we have to setup Burp to listen on the external IP address. Start Burpsuite and go to Proxy -> Options select the current configuration (as shown in the picture below) and click on Edit. Now select the option Specific Address and choose your local IP address (in my case it is 192.168.0.193). For you it can vary depending on how your DHCP server is assigning addresses. If you are unsure which is your IP address, open up a terminal and type (on OSX) ifconfig en0 | grep inet. If you’ve followed this tutorial to this point – 💪 You are now able to intercept traffic through the application without Certificate Pinning 💪! The next chapter will be about bypassing certificate pinning. In order to bypass certificate pinning using this method we need to have a copy of Frida-Server installed on our Android device. To do so, we need the latest version of Frida-Server which can be downloaded from the Frida releases page on Github: https://github.com/frida/frida/releases, you now will wonder which version you need here…🤔 x86? x86_64? arm? – Thank god there is a command for everything! Just do adb shell getprop ro.product.cpu.abi to find out the right version for you, in my case it was x86. So for me the right version to choose was frida-server-10.6.15-android-x86.xz. The experienced reader will notice that the .xz extension is an archive, before we can use the binary we have to extract it first. For the terminal geeks among you just use tar -xJf frida-server-10.6.15-android-x86 for everyone else, the Unarchiver is your best friend. After extracting the binary we once again need to use the terminal. 5.1) adh shell "/data/local/tmp/frida-server --listen 0.0.0.0 & if you want to have frida-server running on an external IP. To verify your Frida installation (both remote and local) you need to do a frida-ps. 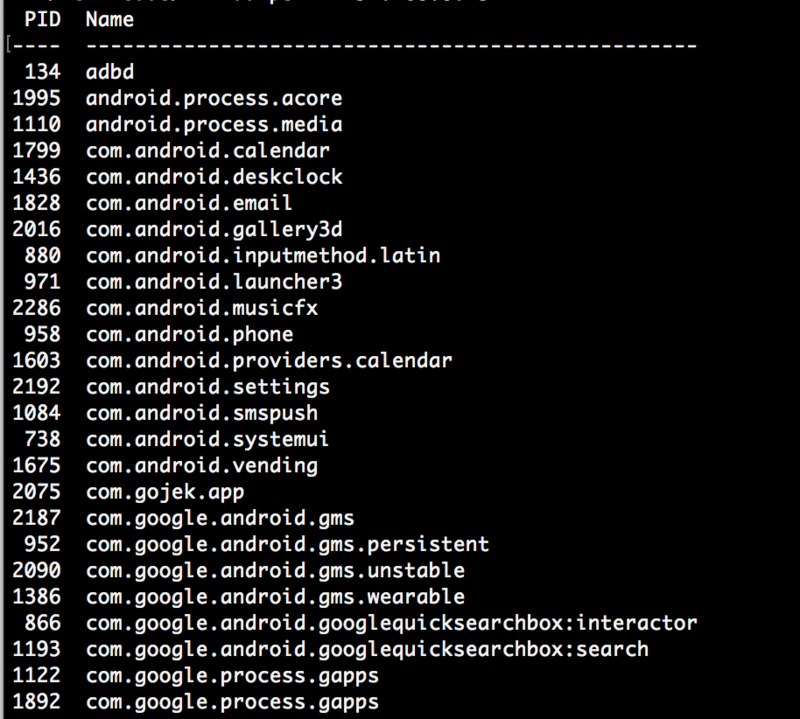 This displays a ps command that produces a list of the currently running processes on your device. If connected via USB: frida-ps U. If you are using frida on an external address frida-ps -H 192.*.*. * whatever the address of your phone is. You are the chosen one, and ready for bypassing certificate pinning. For the proof of concept I am going to use a random application here, if you want a real-word scenario have a look at the many mobile bug bounties which can be found on Hackerone, Bugcrowd, Synack or Zerocopter. To start bypassing certificate pinning, we need the Android SSL Re-pinning Frida script by Piergiovanni Cipolloni, which can be found here, here or at the bottom of this blogpost. 1.) Install the application from the Google Store. 2.) Download the application using Apkpure or apk-dl. After doing so, open your terminal and install the application using adb install com.company.whatever.apk. Done 🐶. The next step is to choose your target from the applications, as we did before this can be done using: frida-ps -H 192.*.*. * for a remote Frida server, or frida-ps -U if you have your device connected via USB. What you need to do next is create a copy of your previously generated cacert.cer (if you have followed the tutorial until this point it should still be in your Downloads folder). 5.) frida -U -f it.app.mobile -l frida-android-repinning_sa-1.js --no-pause 🎉 NOW FINALLY 🎉 – WE DID IT! It means you did everything right and you can now finally intercept all the traffic from those juicy bug bounty programs out there. Nice article! Just a little thing: frida-ps U should be frida-ps -U. Thanks for sharing the useful article. The kind of content you have used it is awesome. I like your way of writing and this article is very informative. Thanks for sharing. First of all thanks for sharing this useful article. The kind of content you have used it is awesome. I wish there could be a video in which these steps should be implemented. I did tried your approach, it’s working and amazing. Nice Article, keep the grea work! Keep coming like this informative helpful article. Your this article has helped me a lot updating my knowledge respect on it. So keep coming like this opportunity. Ofcourse it is a very good article. It had worked for me in many cases, but in some of the apps this is not working. Can you please let me know what is the other steps to be done? Great tips for writing perfect blog post for a beginner as well as for those bloggers who are in blogging from long term but didn’t know how to write a great tips. This is worked for me. Thanks for sharing this helpful content. Keep it up.